Best Fishing Times For Catching Bass? When Bass Are Feeding - Duh! The best fishing times, when speaking of the hours of a day, not a season or month, is without question the couple of hours that mark the transition periods of dawn and dusk. Because the presence and interaction of the ten factors listed below vary from one water body to the next, you will find the specifics of bass feeding behavior to be different as well. However, it is virtually indisputable that a dependable pattern of behavior is that both smallmouth and largemouth feed most vigorously in the evening and mornings. These are hands down the best fishing times for catching bass any time of year, depending on what part of the country you're in. If you want to catch more bass, more often, take luck out of your fishing equation and replace it with knowledge of bass, their habitat and behavior as well as that of their forage, and you will make your own luck. Developing a sense for the best time to fish is the natural consequence of gaining such knowledge. There are many influences on bass causing them to bite. 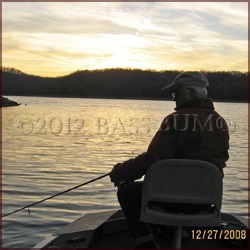 There are movement and activity patterns specific to bass that have long been recognized, though not always understood. These patterns are influenced by and contingent upon the ever changing interactions of seasons, weather and their impact on not just the bass but as importantly, upon their prey. The sustenance of their lives. All these factors play a role in influencing prey behavior and bass location. But no matter which influence or combination of influences may be in effect, ultimately, number one, presence of forage, determines where and when the best fishing times for bass will be. 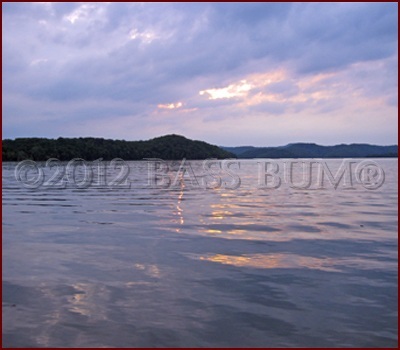 We'll all agree, catching bass is dependent upon finding them. Remember, 80% to 90% of the water you see holds no fish. So understanding where bass may be, as a result of the factors listed above, on any given day, at any given time, in any given weather, in any bass fishing season is what will give you your edge. Both largemouth and smallmouth bass will eat just about anything the can get in their mouths. When small, under 8", they subsist almost entirely on insects. Once they grow larger, especially for river smallmouth, it's hellgrammites (dobsonflies), stoneflies, mayflies, caddisflies, dragonflies, and damselflies under the water's surface. If they find crickets, grasshoppers, ants, beetles or any other unlucky insect thrashing desperately to escape the waters surface, gulp, gone. Largemouth aren't particular either. They'll eat all that stuff too. Especially in hot summer months. However, without question baitfish, threadfin shad (above) and gizzard shad, rise to the top of the largemouth menu and alternate between first or second place on that of smallmouth bass. Crawfish are also a preferred meal and are at times the preference of smallmouth as they inhabit those areas most preferred by smallmouth. But baitfish nor crawfish are ever turned down by either bass. In order to sustain their lives all gamefish engage in repetitive behaviors day after day, week after week, month after month and season after season. One very dependable behavior in spring and fall is their movement from deep to shallow water and back to deep water again. They will move to the shallows just before the sun starts to rise, then retreat to deeper water again only to return when the sun sinks below the horizon. They engage in this daily migration for several reasons but foremost is, that's where the baitfish are. As evening approaches and darkness begins to absorb the light very large schools of threadfin shad move from open, deeper water to the relative safety of the shore where they can hide out in grass, bushes and fallen trees. During the months of April, May and July this migration also involves the shad spawning in shallow water coves. Come morning, as daylight begins to melt the darkness, it's a mad dash by baitfish, primarily threadfin shad, to deeper water where they can find their favorite "soup of the day", phytoplankton and zoo-plankton. Nothing like a plate full of microscopic green stuff for breakfast. They find this segment of the food chain flowing in the current and around bridge and dock pilings. Right behind them are the bass. It is during these two periods of transition from darkness and daylight, before the sun is high and after the sun sets, that finds the activity of both bass predator and baitfish prey at its peak. If you're a bass hunter you're a predator too. So be there at dawn and dusk - the best fishing times. Moon Phase Fishing. Fact or Fiction?